Detail of a contemporary illustration from the Illustrated Police News showing the face of Jack the Ripper as described by witnesses, 1888. Copyright British Newspaper Archive. Jack the Ripper is a phantom, a bogeyman, a shadow in the night. At the height of the terror the Illustrated Police News printed this picture, a mere artist’s impression based on the most recent witness statements. We know that someone committed those murders, that police suspected the deaths of five women, killed brutally in a three month window in the Whitechapel area, were killed by the same assailant. They assumed it was a man, they never caught him. 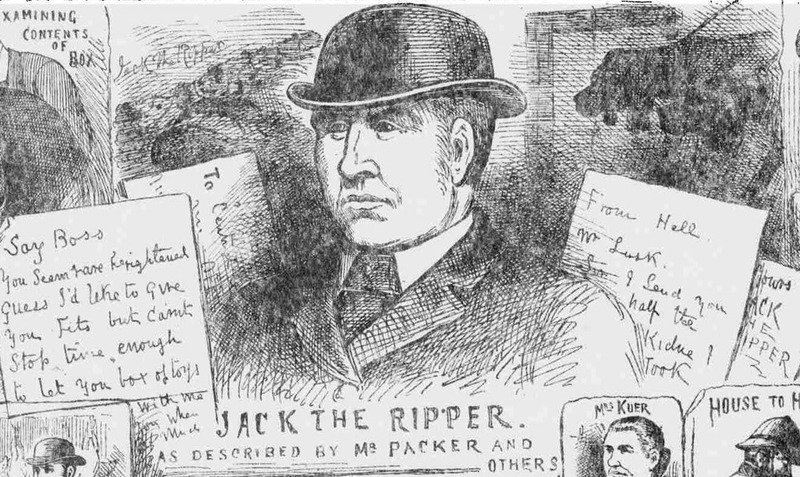 “Jack the Ripper” flirted with the press for a while then faded away. He’s become one of our greatest bogeymen, the archetypal killer, a stock character in film, TV and books. There are countless theories about who he was, countless websites. For a man with no face he’s got a hell of a profile. Then there were the victims. Mary Ann Nichols, Annie Chapman, Elizabeth Stride, Catherine Eddowes, Mary Jane Kelly. Very often they don’t even get a name check, they are simply victims one to five, just pieces of the puzzle that is Jack. Their dead faces are familiar, you can find them easily online (I’m not linking to them myself but if you want to find them go ahead). They give nothing away in those grainy post mortem photographs. Death has brought them a kind of unity, a flat sameness similar perhaps to the way the hardness of their lives would have ground them down in life. These were working class women, whose poverty had dragged them into a precarious existence on the streets. As so many with no other choice they sold their bodies for pennies. These were the women the wealthy would pass by without a glance, unless they wanted to buy. These were the most vulnerable women, the kind that leave no mark on history apart from the odd arrest for soliciting or by meeting an extravagantly grotesque death. There are many like them who died nameless deaths. Take Mary Ann Nichols, whose sad, hopeless life was described by historian Fern Riddell on Twitter last year and in this Storify. Even today the victim is all too often the missing piece of the puzzle. They existence during the trial of their killer is reduced to mere evidence, a collection of test tubes trying to confirm guilt. All too often the victim is a woman and the killer is a man. I’ve written about it so many times; the families outside the court describing the person they felt was missing from the proceedings. The families of Jean Gilbert and Celine Cawley both felt the need to go to the papers to give them a voice. They had the opportunity. How many women die in Ireland and elsewhere whose murder doesn’t cause headlines, doesn’t sell papers. Certainly in Whitechapel in the 1880s attacks on women were so commonplace that there has always been a debate about cases that could have been connected to the Ripper. As this timeline shows the 1880s were not a good time to be a vulnerable woman. And then, thirty years before, when William Kirwan killed his wife Maria, many of the papers didn’t even bother to get her name right. She often appears in the contemporary press as Louisa and these days she turns up as Sarah, Louisa or Maria or even sometimes Mary. It took a lot of digging to find Maria but you’ll hear her husband talked about on the boat over to Ireland’s Eye to this day. Now don’t get me wrong. I get why a Jack the Ripper museum would get visitors. I get why it’s a good commercial prospect. I made my living from the public appetite to murder. I’d be a hypocrite if I condemned it outright. But Dark Tourism needs to be respectful – and it certainly needs to be historically accurate. The frontage shown in the newspaper coverage looks more like a Disney Pirates exhibit and, as many of the angry local residents quoted in the Standard piece pointed out, Cable Street wasn’t the site of any Ripper murders. The area has it’s own proud history and that’s what should have been celebrated. What makes the story even worse, or at least adds a particular piquancy to it, is that the man behind the rather dodgy scheme, Mark Palmer-Edgecumbe, was formerly Google’s head of diversity and inclusion…he told the Standard today “We did plan to do a museum about social history of women but as the project developed we decided a more interesting angle was from the perspective of the victims of Jack the Ripper.” Because obviously a brutalised life gruesomely cut short is so much more inspiring than say, for instance, Sylvia Pankhurst. Local paper The East London Advertiser says that the planning document submitted by the architects cited the closure of the much lamented Women’s Library in the area that “the “Museum of Women’s History”, as it calls the project, would be “the only dedicated resource in the East End to women’s history””. A museum of women’s history would be a great thing. It would be somewhere to teach our children and to educate ourselves. A celebration of murder will not do that. No matter how much detail they give about the women who died. The focus is on the phantom in opera cloak and top hat clutching a doctor’s bag. A cliche who will will teach nothing, inform nothing, provide nothing but cheap thrills and feed base instincts. Judging by the story so far this is a ghoul hunting expedition not a celebration of the resilience of East End women. If they’d done what they said the press they would have got would have been over-whelmingly positive. They would have been championed across the planet as an example of how we are moving forward. Instead the social media carrion crows are circling looking for blood. I wonder if the owners think they’ve made a mistake.